With this cup holder, ensure cups and lids in your coffee station, convenience store, or buffet stay organized and secure. This cup and lid organizer is a fantastic choice for offering paper, plastic and foam cups to the customer. It features four divided compartments to keep cups and lids separated and within reach. No more cluttered countertops or cabinets! This compact design maximizes surface areas with a sturdy non-skid base. Display various sized cups and lids for hot and cold beverages in your home, business, or special event. It is made of steel wire frame with beautiful coated finish. It is easy to clean. And it can hold lids or cups up to 4 1/4" in diameter. The package you receive includes only a cup holder caps. Made of durable iron wire frame with coated finish for long-term use. Specification: 17.32"L x 5.11"W x 8.86"H. It is compact and lightweight with 4 divided compartments, which can conveniently hold cups Up to 4 1/4" in diameter. Convenient display holder for self-service drink station, coffee service area, buffet, snack bar, which makes retrieving cups easier for customers and guest. 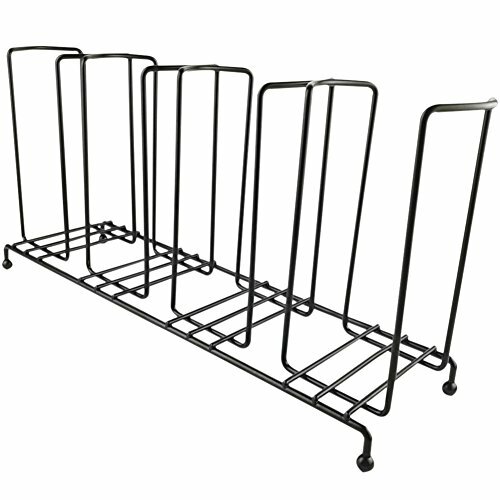 Perfect for high traffic areas, such as office, lunch room, break room ,cafeteria, convenience store, concession stand, lobby, restaurant, church social hall, barbeque, parties, and much more. Black powder coat finish to complement any decor and it is easy to clean. Package include: 1 cap holder (cups are not included). If you have any questions about this product by ZZ Lighting, contact us by completing and submitting the form below. If you are looking for a specif part number, please include it with your message.